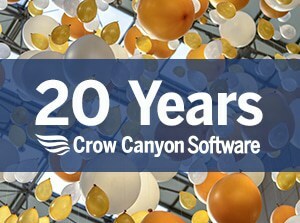 Crow Canyon Software heads to the Big Apple to sponsor the July 29th NYC SharePoint Saturday. Scott Restivo, CEO of Crow Canyon, will be giving a talk as part of the speaker sessions running during the day. The NYC SharePoint Saturday is a free one-day event put on by the SharePoint community to provide educational opportunities in Microsoft SharePoint and Office 365 technologies. The NYC show will be held at Microsoft New York, 11 Times Square, which is just across 8th Avenue from the Port Authority building. The event will feature 60 other speakers covering a wide-range of SharePoint and Office 365 topics. The talk by Scott Restivo will be on “Three Pillars of Application Design”, based on his more than 20 years’ experience building robust applications on Microsoft platforms. Restivo will cover how to use SharePoint and Office 365 to drive user adoption, automate workflows, and provide useful reporting. In the sponsor exhibit area, Crow Canyon will showcase its powerful and flexible business applications for SharePoint and Office 365, including Help Desk, Customer Service, Employee Services, Asset Management, HR, Facilities, Marketing, Purchasing, and others.